Howdy WooCommerce user! If you still believe that email is the king and are looking for best ways to customize WooCommerce emails, you are at the right place. 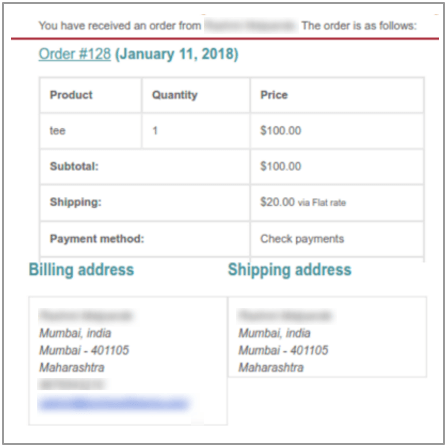 Order on-hold email – Contains order details after an order is placed on hold. Order processing email – Sent after the payment is done and contains order details. Order completed email – Sent to customers when their orders are marked completed, and indicates that order has been shipped. Order refunded email – Sent to customers when their orders are marked refunded. 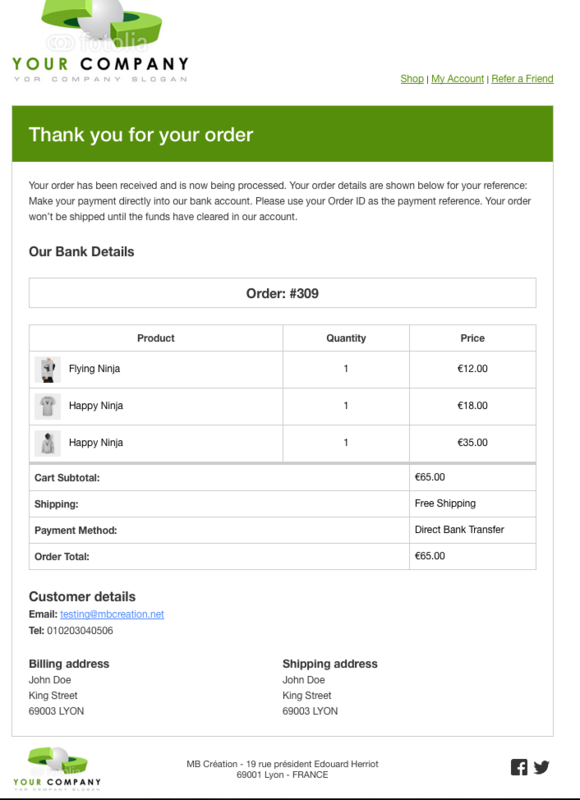 Customer invoice email – Contains order information and payment links. Customer note email – Sent to the customer when a customer note is added from the edit order admin. Password reset email – When you forget the password and request for a new password. New account email – Sent to the customer when a customer signs up via checkout or account sign up page. In short, the emails consist of following details – product information, the total price including taxes and shipping charges, mode of payment, shipping & billing address. A sample confirmation looks like the below snapshot. All the above WooCommerce order emails look dull and plain. It lacks the oomph factor. It doesn’t carry your brand and positioning. More often than not, the human tendency is to get aroused by the colors and by the design we see but unfortunately, the WooCommerce default order emails are boringly humdrum, plain and unimpressive. Thus, it poorly reflects on your value proposition, your customers including your loyal ones may perceive your brand in a less positive way; which in turn, leads to higher churn rate. That said, these transactional emails are a hook point with your customers. The moment you lock your base audience, business picks up pace and financials look promising. Everyone still reads emails. And you better look good in them! People may skip breakfast but not checking their inboxes at the start of the day, Be it social emails, promotional emails, and business emails. We infer the brand image and capture the essence it carries from the very 1st glance at the email. Thus, it all boils down to the fact that sending out an alluring and convincing email to your customers not just tightens the bond but also fosters your business. Sometimes or the other, we read emails twice not because we fall in love with the email but the way it is drafted including the minute details of the product or service. With every dollar spent on email marketing, a maximum sum of $38 can be earned, proven fact. Now that importance of sending out a vivacious email is known, why not customize WooCommerce emails in the first place? Why you must customize WooCommerce emails? Customizing WooCommerce emails is not a rocket science to comprehend. Rather a cake walk (if you use plugins). One can play with styles of the email, colors, alignment, pictures and a lot more. Nonetheless, customized emails are a big boom to the service providers for the fact that customers relate to the brand. A properly drafted email aims at recognizing the customers, valuing them and it actually interacts with them. Hence, the very emotional belongingness does the trick for your business. In the long run, customers become your loyal fan bases. It adds momentum to your brand. It’s a jackpot change for brand managers, for maintaining customer relationships and taking the bond beyond the purchase. On top of everything else, it’s super easy. Since the templates are pre-defined, the store owners need not worry about inventing a template every time a transaction happens. The best part about customized WooCommerce emails has to be their responsive design that makes the life of store owners and marketers easy. Now, we guide you through the process of customizing these emails. First, we’ll look at some technical part and then look for the best plugins to customize WooCommerce emails. It will also make clear whether to opt for plugins or code the templates. Essentially WooCommerce allows customizing emails in 3 different verticals – settings, overriding and action/filters (hooks). 1. Settings: One can change the background color, text color, base color. The catch comes in the form of restricting any changes to the layout and email body. 2. Overriding: In case you wish to change the layout of the email, you can alter the HTML of the template. 3. Hooks: In addition to the above changes, you can also add additional content through hooks without disturbing the layout. Let’s learn each of the three in details. 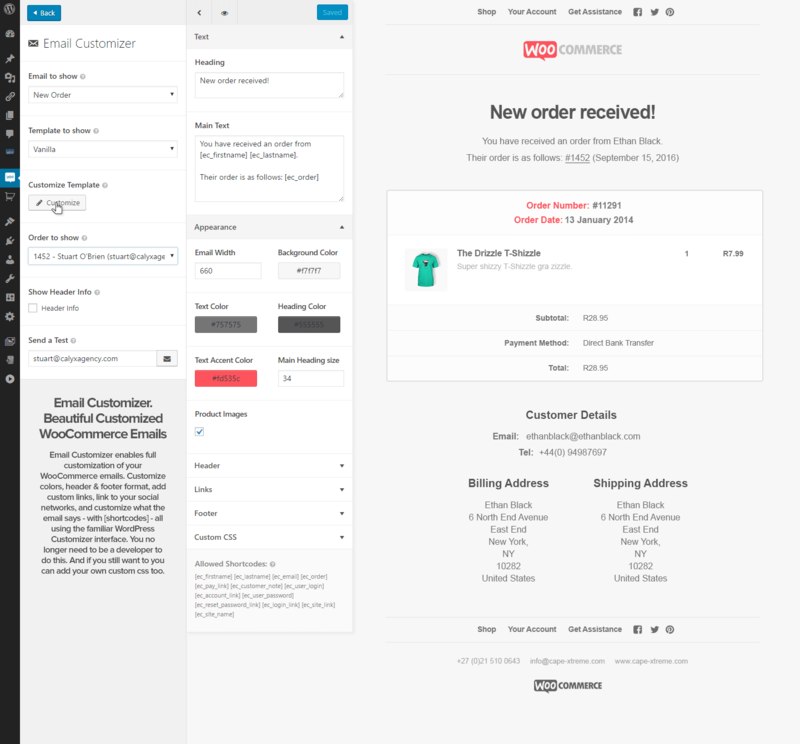 The WooCommerce admin allows some basic customization of this default email layout. These options could be accessed after logging in to the WordPress Admin and then going to WooCommerce > Settings > Emails > Email Sender Options. Remember that these choices apply to all emails. You can create a customized email by altering and setting a header image, custom footer text, and another base color within minutes. A little more comfortable you are with code and you can change content as well. Another approach is to modify the default email layouts. WooCommerce offers a helpful template system that allows you to customize parts of emails by replicating the format file(s) into the theme. Every email type has a template file for its content. In addition, there are shared templates that all email types can access and use. These could be found at woocommerce/templates/emails/email-styles.php. In many cases, this is the template that developers override to change shared aspects of the emails. First you make sure that the following directory exists in the WordPress installation: wp-content/themes/your-theme/woocommerce/emails. 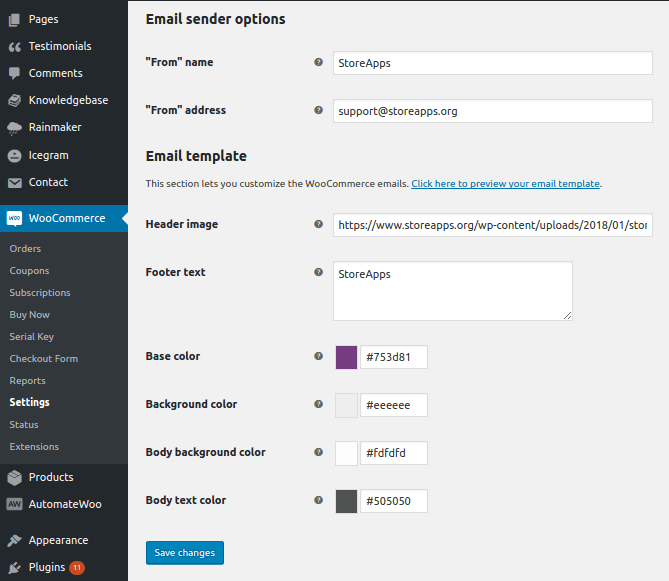 Finally, edit your-theme/woocommerce/emails/email-styles.php to change the footer text color. This approach to customizing emails deals with WooCommerce custom code. Obviously, it requires a high-level of expertise in PHP. But, the process is straightforward because the original WooCommerce layouts are still in use. The process involves changing portions of the content. For example, you want to add the Shipping method chosen, in the order email. You could use the ‘woocommerce_email_after_order_table‘, or ‘woocommerce_email_before_order_table‘, to add the content. Remember, these methods are tightly linked to the theme you choose. Hence when you change your theme, you will have to move your modified template files, or the added actions, to the new theme as well. Well, all heard and said about email templates on WooCommerce, the fact of the matter remains unfazed – a plethora of benefits. Of late, quality content has been attracting buyers the most, be it on podcasts, laughter clubs, journals or emails. When such is the importance of content that goes into emails, drawing parallels among various genres of emails is the key. It’s not so cool to have the same content on confirmation mail, welcome mail, order completed mail, order refunded mail or order processing mail. Deciding on the content to be embodied in the email is a deal breaker. Therefore, package the emails with the following ingredients. Refer to the customer’s name and start distinguishing your brand from others by highlighting the USP of your brand. Once the email is sent, definitely there would be certain steps that the customer has to ascertain or complete. List them in order of priority so that the customer feels easy and right about the following steps. Come on. Tame your customer repeatedly to buy from your store. Nurture the customer to know his choices. Thanks to analytics. Recommend the products based on his/her search preferences. Instead of sending the same old monotonous emails to customers, spice up the email by an inch – give your customers the liberty of space to feel the brand and let them associate with it. With just a few clicks you can come up with terrific emails that bring extravagant results in return. If a fact has to be revealed, doing business is all about maintaining the relationship with the customer, long-term I say. There are many plugins available on the market. We have compiled the 6 best plugins for WooCommerce users. Not to scare you, but letting you know, most of the customizers available in the market requires code changes. And not everyone can play with the code. Why don’t you try something that excites your customers? Make them smile, make them feel happy by sending personified emails. More so when they are available at the drop of your hat. With Email Customizer for WooCommerce plugin, users can sit back and relax, because it does what it does. 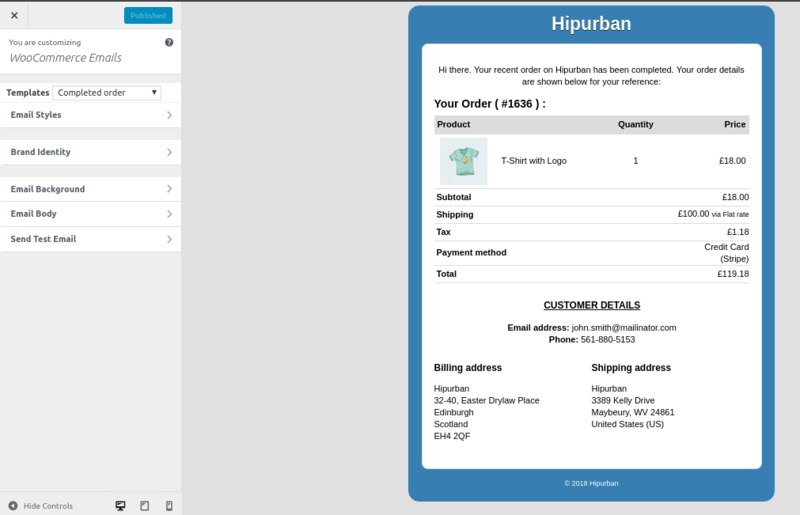 A sample email from Email Customizer for WooCommerce looks like the below image. From the house of StoreApps, Email Customizer for WooCommerce costs $49 for one site, $99 for five sites and $149 for 25 sites. WooCommerce Email Customizer has the built-in WordPress Customizer that allows you to click, drag and drop to visually modify your email templates design. You don’t require any coding knowledge. But remember, this plugin only customizes the design of your emails and not the text or content of emails. This a popular WooCommerce email customizer plugin on CodeCanyon. It provides a playground to explore the customizations using a Customizer which is similar to the WordPress Customizer. YITH WooCommerce Email Templates plugin is available for €53 for a single site, €81.00 for 6 sites and €147 for 30sites. But, there’s no live preview available. There’s also a free version on the WordPress repository with limited functionality. 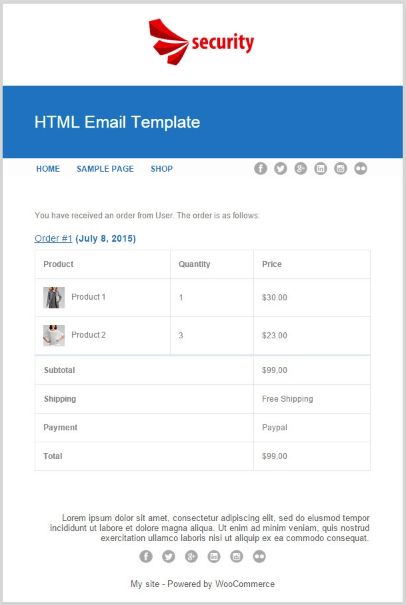 Another WooCommerce email customizer plugin available on CodeCanyon. Priced at $19, WooCommerce Pretty Emails is one good option for customizing your emails. Developed by RightPress, Decorator – WooCommerce Email Customizer is a free plugin available on the WordPress repository. This plugin does only one thing – it sets up a separate instance of the Customizer tool and allows you to make changes to your WooCommerce emails with live preview. Now that we have fed you much about plugins, Email Customizer for WooCommerce stands out differently from rest others. The very 1st glance of it generates vibes in the customer. Amazingly designed and creatively customizable, the plugin is a must for WooCommerce users. Alright. Much to your blithe comes this noteworthy piece of advice. In all likelihood, emails are like love letters. We got to let our customers feel the brand, perceive it the way what we actually want them to, and accept our brand image, let that sink in their minds and that stays forever. The more interesting they are, the more the chances customers fall in love with the brand, and that is business. Thank you very much Akshat for the detailed article on this topic. I’m amazed, I have to admit. Seldom do I encounter a blog that’s both educative and engaging, and let me tell you, you have hit the nail on the head. I have no website using woocommerce, but this is legit info!